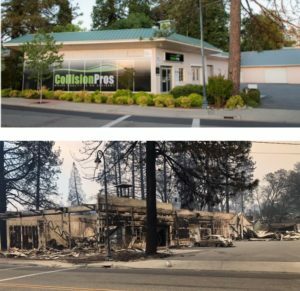 The Paradise, Calif., location of the four-shop Collision Pros has been destroyed by the Camp Fire raging in the California Sierra Nevada area, and the owner seeks assistance for his employees’ families. The industry can help in one of two ways. Collision Pros owner Brian Von Tress has created a GoFundMe page specifically for his team, seeking $30,000. As of Monday just before 2 p.m., the shop had raised $15,280. 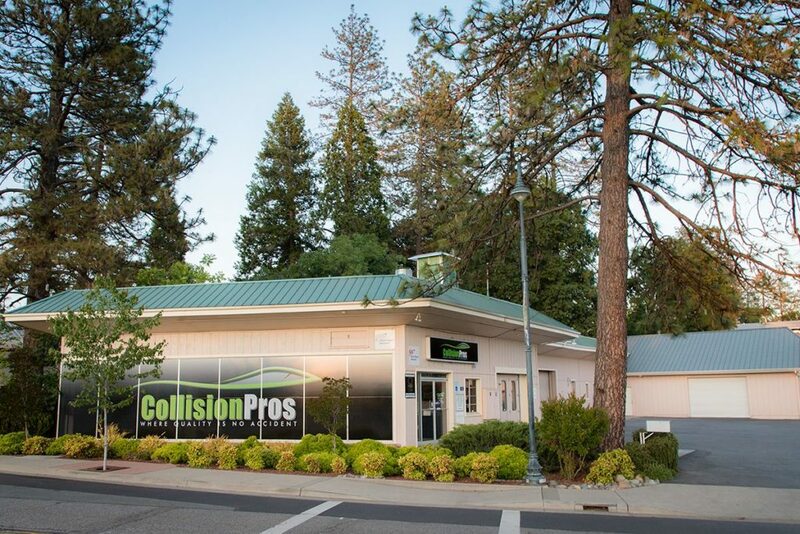 The Collision Industry Foundation, created specifically to help anyone connected to the collision repair ecosystem following disasters, is also in contact with Collision Pros about aid. Unlike GoFundMe donations, contributions to the CIF are tax-deductible and can be used for other businesses too. “I’ve been overwhelmed by the number of people who have reached out asking what they can do to help,” Von Tress wrote in his GoFundMe description. Von Tress wrote that the shop employs members of eight families who lost everything in the devastating fire. As of Nov. 12 at 10:45 a.m. ET, the Camp Fire had burned 113,000 acres and was 25 percent contained. It destroyed 6,453 residences and 260 commercial structures and threatened 15,500 locations. He vowed to donate “100% of these funds” to the victims. “If we could raise these funds this week, I’m sure it could change lives,” Von Tress wrote. Von Tress also planned to post a list of other items the families might need. “I’m trying to help the employees through stuff,” Von Tress said in an interview Monday. The business itself is struggling too. Von Tress said he has discovered “we’re grossly underinsured” on the shop’s contents and learned that his landlord let the insurance lapse on the structure. “There’s no building anymore,” he said. The shop had only purchased the facility (formerly known as Classic Auto Body) two years ago, according to Collision Pros’ website. Even if Collision Pros were to rebuild, the fire also took away its customer base, Von Tress said. “Nobody lives there” following the fire’s devastation — nor would they for years, Von Tress said. “It’s just a horrible situation,” he said. His employees’ tools were all contained within the facility. “There was no getting anything out,” he said. Representatives delivering the evacuation order said occupants couldn’t gather their things. Von Tress said he’s attempting to wade through the insurance situation and wasn’t sure if his employees’ tools were covered or if working at another Collision Pros facility would affect their claims. Even if the staff were transferred to another Collision Pros, it would mean the site’s regular employees would lose hours, he noted. “We’ll keep ’em on payroll somehow,” he said. He said seven of the families were confirmed to have lost houses in either Paradise or nearby Chico, Calif. The eighth likely did as well, but the more rural location of the home prevents the employee confirming the loss, according to Von Tress. Three of the families were renters and lacked renter’s insurance, he said. The other five were insured but don’t know how fully they’ll be covered, according to Von Tress. Either way, the loss inevitably “costs something,” he observed. The shop has given each family a $1,000 gift card to buy necessities, and Von Tress’ church has also responded to help donate clothes and diapers and take the children shopping for toys. Von Tress said his shop handles the vast majority of the business in the area, but three other smaller collision repair facilities serve the market as well. He said he assumed his competitors were destroyed as well. Their people and other individuals with ties to the collision industry might need help after both the Camp Fire and the Woolsey Fire in Southern California, though CIF board member Michael Quinn (AirPro) said Monday that Von Tress’ was the only one to have reached out at that point. The Woolsey Fire has burned 91,572 acres and is only 20 percent contained as of 12:29 p.m. ET. At least 370 structures had been destroyed — only 15 percent of the damage has been examined — and 57,000 threatened by the fire. CIF is a good resource for donors and victims of shops lacking Von Tress’ initiative or employee support. CIF memorably contributed about $250,000 in donations and helped about 150 households following Hurricane Katrina in 2005. It provided more than 80 tool sets during that storm — often more important than other donations, as technicians felt, “‘If I had tools, I could work,’” according to board member Jordan Hendler (Washington Metropolitan Auto Body Association).